I was fortunate enough to have the opportunity to participate in a tower lowering party this afternoon and met a group of really nice hams in the process. A local business with a 140 foot tower didn't need it anymore and offered it to anyone for free as long as they took it down. 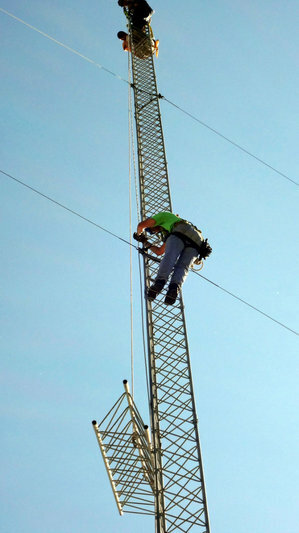 One of the local hams took them up on the offer and today the tower lowering began. Having no experience with towers, I was eager to see one up close, watch how one gets taken down and do what I could to help out. 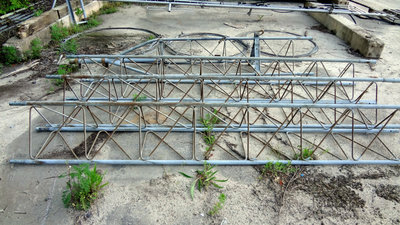 By the time I got to the site, the antennas and hardlines had already been taken down (a task that took up most of the morning). 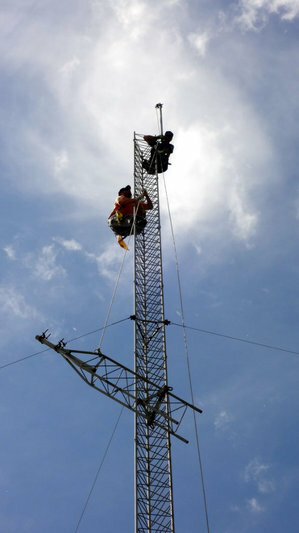 Here's the ground crew and two of the guys up on the tower working on undoing the top section. I counted 14 sections of tower, which I was later told was Rohn 45 (commercial grade stuff). The guys climbing the tower were working pretty high up. The top section of the antenna turned out to be pretty stubborn to get off, but eventually it came off and made it onto the ground. It took the bulk of the afternoon, but eventually three more sections of tower were brought down. I guess after being up for 30 years, those sections of tower get stuck to each other pretty good. I didn't do any tower climbing (left that to those more experienced than me) but I did help out on the ground with lowering the sections. As a relatively new ham, it was a great learning experience for me just being able to watch the process. Got to see how a gin pole works, see just how much work it is to take a section down and handled tower sections. Four sections of tower down, ten more to go. Looking forward to the next session. Towers are usually easier to put up than to take down. 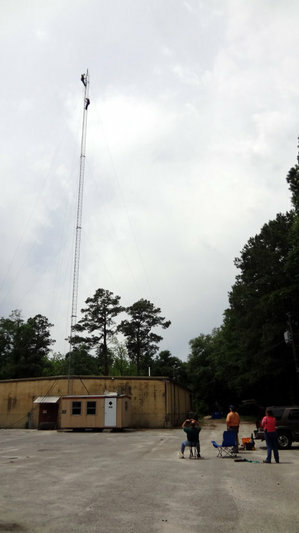 That may make two or three nice towers for someone if they are only wanting a 40' to 60' tower!